Despite the title of Elizabeth Abbott's book, history of sugar is not sweet, oh no. It is grim and dark and sad and the author spares no detail in painting the tragic picture. Sugar: A Bittersweet History follows the ascendancy of its hero from the long-gone times when it was a treat reserved for royal tables to here and now, when it is increasingly blamed for a range of rampaging diseases. 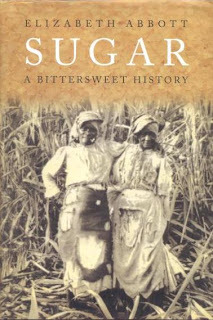 Most attention, though, is given to all the centuries in between, when sugar trade was the main factor in the rise and fall of sugar slavery. Abbott follows the trail of sugar slaves century by century, island by island. She is only too generous with stories of hardship and cruelty that were a part of life on cane plantations in the West Indies. The heartbreaking scenes are mixed with cameos from London and elsewhere in Britain, where rich planters came to show off their spoils and secure the dominance of the sugar business. Despite all their riches, the conscientious citizens soon started to clamour for abolition and after many years of political battles the law was changed accordingly. Process of freeing slaves was gradual and difficult for all concerned, but eventually the lives of sugar workers improved somehow. That's the skeleton of the story. Abbott fleshed it out with plentiful information, spread across impressive geographical range. Slavery is the main focus of the book, but such is the nature of the sweet crop. Towards the end of the grim book Abbott jumped head-first into rosy optimism. The last few pages are full of hopeful visions of well-paid workers cultivating sugar cane as a biofuel crop. I found this ending somewhat unreal and forced, but I'm gloomy by nature. Perhaps other readers will be convinced. Happy end or not, the book is well researched, well written and well worth reading.